Translated and Edited by Warner Wells M.D. There appear to be very few books written by Germans or Japanese describing wartime civilian life. This is one of the exceptions, indeed a victim's-eye view of being on the receiving end of an atomic bomb. 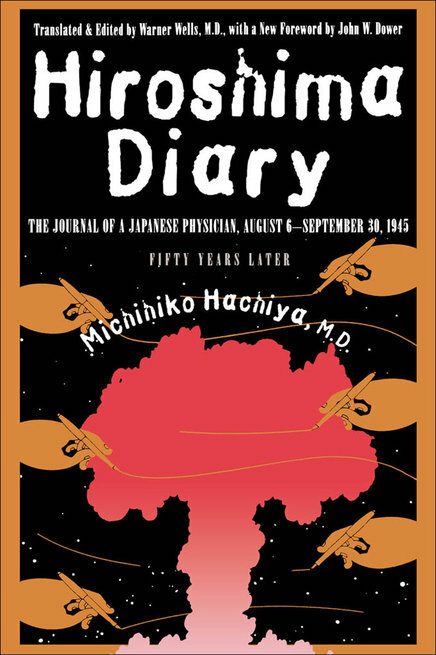 This book is the personal diary of the medical director of the Hiroshima Communications Hospital. The diary begins on the morning of the blast, 06 August 1945, and ends roughly two months later on 30 September. The author, who was at home at the time of the event, was injured but not burned or blinded. He managed to get to his hospital where he was laid up for a few weeks while his wounds healed. The author's hospital, a reinforced concrete structure located some 1500 metres from Ground Zero, was badly damaged by the blast but continued to function, albeit at a very primitive level with no running water, no electricity, and most windows blown out. The hospital was terribly overcrowded with very badly wounded and burned patients, and with almost non-existent sanitation. The author refers to external conditions only in passing: the thousands of badly burned dead, many more thousands of dazed, badly burned and injured people fleeing the city by any possible means; the devastating fires that followed the blast; the filth and stench that pervaded the hospital, and the millions of flies everywhere. The author refers only briefly to external events: News of the Japanese surrender on 15 August came as a big shock, followed by vilification of the military for letting the Emperor down. Until the surrender, there had been general support for the war, and civil order and discipline had been maintained; after the surrender both started to break down, notably with an increase in begging and looting. American and British personnel started to be seen in Hiroshima around the beginning of September, but the first formal American visit to the hospital came on 28 September. There were further visits on 29 and 30 September, and that is where the diary ends. However the Postscript, completed seven years later, refers to further visits by American officers, and a developing mutual respect and friendship. The author as a educated man, a doctor, and medical director of a major hospital, could read and write, but not speak, English. Consequently, he personally had no fear of Americans, although some members of his staff did not share his confidence. In this respect, the translator's account of how this book, the English version of the diary, came to be is interesting and instructive, even touching. I found this book to be of great historical importance. Readers should be aware, however, that the translator took great pains to retain the understated, low key, almost dispassionate tone of the original Japanese text. Only after reading it carefully and reflecting on what the author has said does the emotional impact of the narrative come into focus. I first heard about the book "Hiroshima Diary" almost sixty years ago, shortly after it was published. My father was a Professor of Physics at the University of Toronto, and deeply involved in Canadian defence research during and after the Second World War. In the 1950's, the subject of a possible Soviet nuclear strike on North America was a not-infrequent subject of conversation at our dinner table. One night, in response to my question, Dad mentioned this book as a record of what the aftermath of a nuclear strike might be like. Also about this time, the United States detonated the first Hydrogen Bomb (Ivy Mike, 01 November 1952). I clearly remember my father saying that Ivy Mike was not a weapons test but rather, as he put it, "They built a laboratory, and then blew it up." Fast forward about forty years. By then my own career in defence research was well established, and consequently I was acutely aware of the almost impenetrable secrecy surrounding U.S. nuclear weapons development. But then details of early U.S. nuclear weapons research were declassified and, to my surprise, my father's capsule description of the Ivy Mike event turned out to be essentially correct! How did my father know all this? How did he know about the book "Hiroshima Diary"? Dad was involved in Canadian defence research but, as far as I know, he never held a security clearance and he never travelled to the United States, although he travelled to Chalk River several times for reasons he never discussed. One possible connection (emphasize "possible"): In 1944 Dr. Carson Mark went to Los Alamos as a member of the British delegation to the Manhattan Project. In 1947 Dr. Mark succeeded Hans Bethe as head of the Theoretical Division (essentially the design bureau) at Los Alamos. Dr. Mark was thus in charge of a very large proportion of all post-war U.S. nuclear weapons development until he retired in 1972. I then discovered that not only was Dr. Mark a Canadian (and thus able to stay at Los Alamos after all of the Brits had been sent home courtesy of the McMahon Act) but that he had obtained his doctorate (in Mathematics) from the University of Toronto in 1938 where my father was on the faculty of the Physics Department. Did my father thus know Carson Mark? Was that the channel of information, despite the draconian secrecy surrounding American nuclear weapons research? Was there some other "old boy network"? My father is now long dead (as is my mother), so I guess that we will never know.